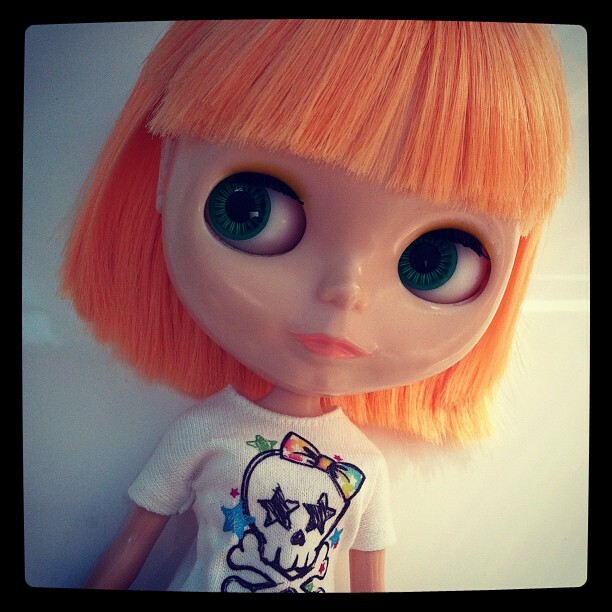 Girls Wear Blue Too: Blythe Doll customisation. 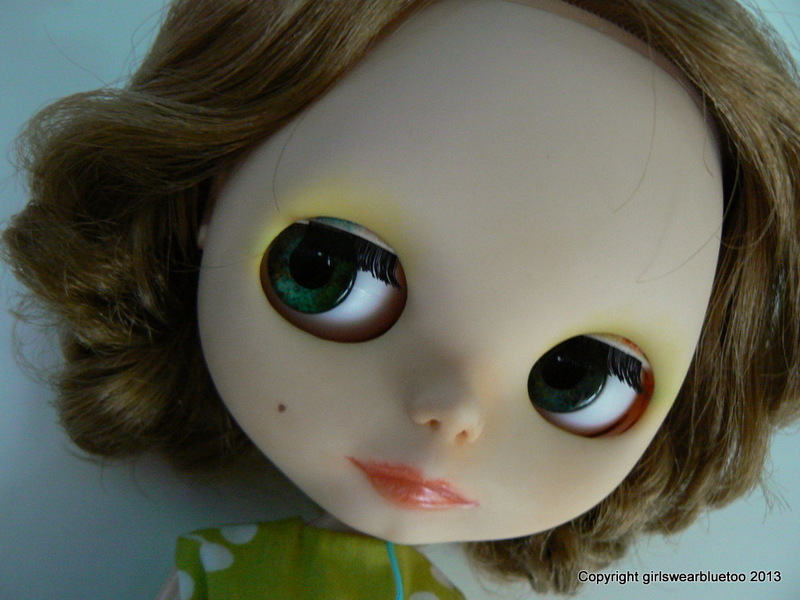 Recently I tried my hand at re-doing a Blythe dolls make up for the first time. This is how she looked when I originally got her last year. I had previously opened her head up and changed her scalp, to give her different hair. I had applied fabric to her eyelids and given her sleep eyes, this means she can have her eyelids closed if you would like, they don't automatically spring open when you change her eye colour. When I decided to commit to giving her some colour I had already carved her face ( a little ) and sanded her stock make up and shine off. 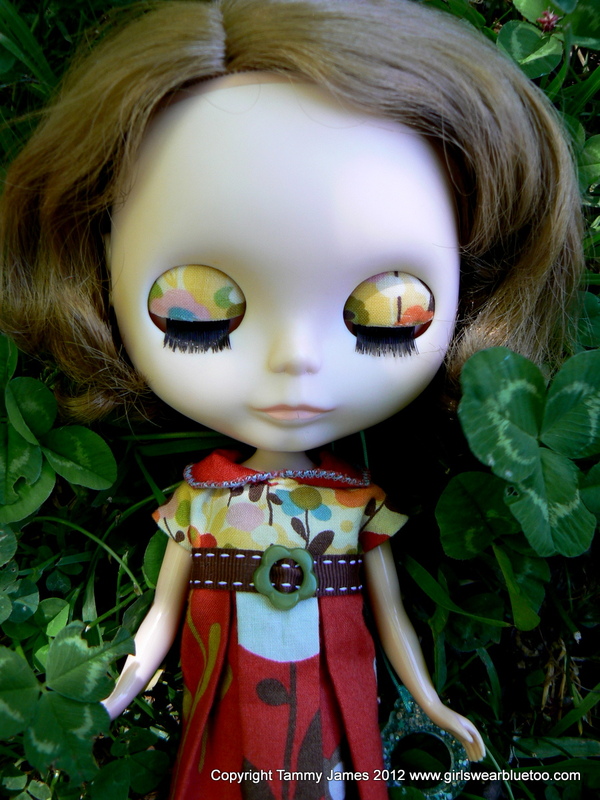 I so love the creative avenues Blythe has opened up for me. From my knitting and sewing to carving, playing with colour ... endless things really ... even just the fun of dressing a doll up in a pleasing visual arrangement can make my creative soul sing. If anyone had told me 18 months ago I'd be carving a plastic dolls face and giving her make up I would have thought they were Crazy! My little plastic family is so good for my creative core and feeds my inner child too. I'm linking up with Clare where you can read about other girls and their dolls, and if you join in with her linky you have a chance to win some fabric. I'm always a bit cautious to blog about my dolls but they are a part of my everyday so I am trying to embrace it. Your girl is gorgeous, especially after her makeover.